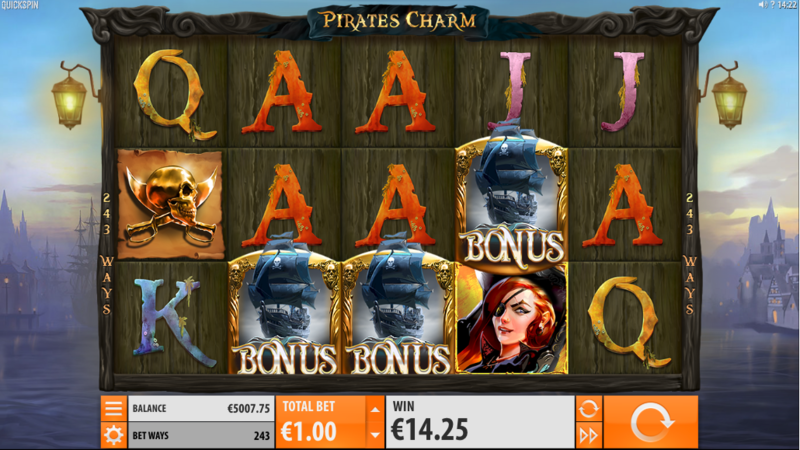 It’s our enduring belief that any online slot themed on historical Caribbean piracy can only be a good thing and here’s another way to test those views; it comes in the shape of Pirates Charm and it’s a Quickspin Gaming slot with multiple bonus features. 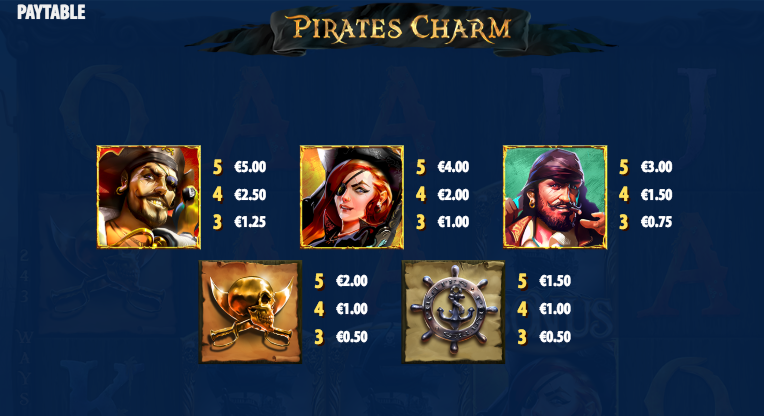 Pirates Charm is a five reel slot with three rows and two hundred and forty three ways to win which means that wins are possible as long as there are matching symbols on adjacent reels starting from the left hand side. The reels spin on a wooden structure which floats against a backdrop of calm, rippling, harbour waters in some colonial outpost. The higher value symbols include the pirate captain, a female pirate and a third scurvy shipmate along with a gold skull and crossbones and the ship’s wheel; 10, J, Q, K and A make up the lower values. There’s no wild symbol in Pirates Charm but there is a pirate ship scatter which is the key to the main feature. The Mystery Charm is the gold object which occasionally turns up on the reels and when it does, all in view will transform into the same symbol (except the scatter) to perhaps help out with a win. This is triggered by landing Mystery Charms on reels one, two and three in the same spin; those charms will freeze in place while the reels are respun – any more charms appearing will extend the feature with another spin. On any base game spin there’s a chance that extra charms will be added to the reels. 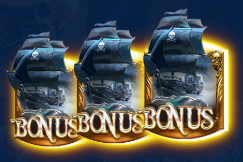 Trigger this by landing three of the pirate ship scatter symbols anywhere in view and you’ll now receive ten free spins in which any Mystery Charms landing will remain in place after paying out for any wins. Unfortunately it’s not possible to trigger any more spins. Well what’s not to like about Pirates Charm? High quality graphics, plenty of pirate action and several bonus features (two of which combine in the free spins) to keep things interesting. This slot is a lot of fun and comes with an RTP of 96.49%.